However, I feel that ethanol makes a lousy fuel for internal combustion engines. In fact, lots of folks think corn is the least-promising bio-fuel of all. Unfortunately, this horse has left the barn – ethanol as a motor fuel is here to stay. There is some slight advantage in reduced carbon monoxide with ethanol / gasoline blends. However, there are better strategies to achieve this worthy goal without making life miserable for vintage motorcycle owners. The issue is inherently controversial and complicated by various political, economic, social, environmental and agricultural policy issues. No matter – the ethanol lobby has done their job and we’re now all forced the enjoy the consequences of a swift march to ethanol! Not only will you pay more for food products (due to competition for corn), your carbureted engines will not run as well as they should. I’m not a chemist, but I am very concerned about the quality of fuel sold today. Most markets in the US now sell an E10 blend (10% ethanol) year round. Depending on local regulations, this information may or may not be revealed at the pump. Typically, this blend is marketed as “gasoline” which it is certainly not! In some markets, the ethanol concentration is even higher for “seasonal” summer blends. I don’t think it is ethical for oil companies to sell “gasoline” that is diluted with any percentage of ethanol without full disclosure – no matter what local regulations allow! None of this is good for vintage carbureted motorcycle engines…especially those will ultra small idle passages such as the GL1000, GL1100, GL1200, CBX and CX500. Below is a summary of problems associated with fuels oxygenated with ethanol (like E10) documented in several Technical Papers by Chevron. I believe this is a credible information and I agree with these conclusions. Update: 6/16/08: Curiously, I just noticed that Chevron has retracted those white papers from their website! But, similar info is published here by Fuel Testers. 1. Ethanol has less “energy” than gasoline so fuel mileage is slightly reduced. My own experience with ethanol blends has demonstrated this beyond a doubt. 2. Fuel Degradation: Oxygenated gasoline oxidizes and forms gums and deposits more rapidly than “pure” gasoline. These deposits wreak havoc on the internal passages in carburetors. The storage life of ethanol / gasoline blends is reduced. 3. Moisture Attraction: Ethanol attracts water. Lightly used, carbureted engines with small passages (like the GL1000) are prone to internal corrosion when stale, moisture-laden fuel sits in the bowls. 4. Fuel Tank Layering Effect: Gas-ethanol blends absorb water. The water may be condensed out of the ambient air or be residual contamination in the fuel tank. If enough water is absorbed, the fuel will tend to separate into two liquid phases: a top phase of nearly pure gasoline (and oil, in the case of 2-stroke fuel) and a bottom phase of water and alcohol. This water-laden mixture will make the engine difficult or impossible to start. To solve the problem, the separated mixture must be replaced with fresh gasoline….no fun at all. 5. Lean-out Effect: Oxygenated gasoline results in a leaner air-fuel mixture. This will corrupt the perfect air fuel mixture calibrations designed into your bike by Honda. The leaning effect will also tend to make the engine run hotter than normal. In extreme cases, engine damage can result. 6. Vapor Lock Problems: “Vapor lock” results from fuel vaporization which can make an engine stop during operation in extreme cases. It usually manifests itself as very hard starting when the engine is fully warm on a very hot day. Vapor lock prevents normal output from the fuel pump since it’s designed to pump liquid not vapor. Gasoline blended with ethanol increases the likelihood of vapor lock. 7. Materials Incompatibility: Older engines such as vintage motorcycles have experienced many problems with rubber parts (fuel pump diaphragms, needle valve tips and seats, fuel lines, gaskets, etc.) when first exposed to oxygenated gasoline. Replacement fuel system parts (such as all of the products available from Randakk’s Cycle Shakk) have been engineered to be compatible with oxygenated gasoline. 8. Solvent Effect: Oxygenated gasoline may loosen deposits from fuel system surfaces (especially fuel tanks) because it is a better solvent than conventional gasoline. The suspended solids can plug the fuel filter and carburetor passages. This is most likely to occur when older equipment is first fueled with an oxygenated gasoline. On the plus side, a pristine clean fuel system will stay cleaner using fuel blended with ethanol. Higher concentrations of ethanol are known to cause disintegration of rubber components. E85 (85% ethanol) must absolutely be avoided and not used under any circumstances…even emergencies. It will ruin the rubber fuel system components in any vehicle that is not certified as a Flex Fuel vehicle. There have been a few reported cases of E85 being “accidentally” marketed as E10 in some markets. In NC, the Department of Agriculture is supposed to police this. But, they don’t have the manpower or the apparent will to do so. Unfortunately, this situation is typical for most states. Even if you disagree with my views on ethanol, here’s some solid advice on managing the fuel in your bike’s tank. 1. Ethanol-free pump gasoline. Available in most markets …sometimes call “landscaper’s fuel. 2. Ethanol-free “Marine” gas sold as most marinas. 4. Race gas …sold at select Sunoco gas stations, etc. Stabil Marine Formula – this is the only fuel stabilizer I use and recommend! Use a fuel stabilizer (like Sta-Bil) year round in every tank! Stuff happens and you never know when the last ride of the season will be. 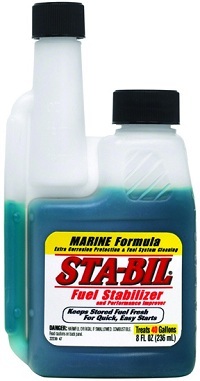 There is a newer version – Stabil Marine Formula that has merit. The marine formula version has extra cleaning and corrosion prevention agents…both useful to fight the negative effects of ethanol. Use Marvel Mystery Oil in every tank of fuel to prevent fuel system corrosion. Follow the directions on the bottle for correct “recipe” which is 2 oz of MMO per 5 gallons of fuel. The will keep the internal, moving parts of you carbs lightly lubed. MMO is also very effective at retarding rust inside the fuel tank. Note: MMO is not necessary if you use Stabil Marine Formula. That product already has sufficient lubrication agents. Run your motorcycle to a full heat cycle (until the radiator fan comes on) each time you ride it. Having fresh fuel flow regularly through fully warm passages is the best defense to keep them clear. Ride your motorcycle frequently and for long distances whenever possible. Lightly used bikes have more problems with oxygenated fuel. Get a heated vest, winter gloves and perhaps a windshield to extend your riding season. The less your bike sits the better! Consult your Owner’s Manual. On a model such as the GL1000, use regular grade fuel as recommended by Honda …not premium. Regular seems to resist going stale a bit longer. Besides, unless you have a modified engine you’re wasting your money on premium. If your bike knocks and pings on regular and seems to run better on premium, then you probably have a carbon buildup on the top end that needs attention. Avoid octane booster products as well. Pros and cons on this one, but here’s my advice: don’t drain the fuel bowls during a typical winter lay-up of 3-6 months. I believe you are better protected from problems by having the carb bowls full of stabilized fuel for short lay-ups like this. Longer lay-ups are a different matter however. Buy the best brand of gasoline you can find. Never buy gas when the fuel tanker is unloading. I recommend a so-called Top Tier gasoline. These brands of gasoline have superior additives packages, better consistency and stricter handling standards. They are recognized and recommended by major auto companies to ensure optimal engine performance and reduce emissions. “Rotate” you fuel. When the fuel in any of my lightly-used bikes reaches 6 months of age, I transfer it to the large tank in my truck for digestion. Then, I put fresh fuel back into the bike. DON’T BE TEMPTED TO USE E85 (85% ETHANOL) FUEL UNDER ANY CIRCUMSTANCE. E85 stations are popping up in my area. For fear of a tanker truck fueling mistake, I avoid them completely. All internal carburetor parts offered for sale by Randakk’s Cycle Shakk are approved for use with gasoline. The materials are long-established to be impervious to gasoline by the chemical firms which provide the materials. They will also tolerate a reasonable amount of ethanol in the “gasohol” fuel which is commonly marketed as gasoline in most markets in the US (with or without notice at the pump). E10 (10% ethanol) is an acceptable fuel as well as “seasonal” fuel (15% ethanol) which is marketed for summer use in some markets. This is the maximum recommended amount of ethanol in fuel marketed as “gasoline” for use in carbureted engines. Avoid ethanol altogether if you can for the reasons cited above. What About Fuel Cleaner Additive Products? Carb cleaning products intended for use in the vehicle’s fuel tank are not a panacea. In fact, continuous use of in-tank fuel cleaners or using in higher concentrations than recommended is bad and can lead to premature destruction of internal carb rubber parts. GL1000 Float bowl gaskets in particular are prone to shrinkage in the face of fuel additive abuse. The fuel system cleaner I recommend is the Yamaha Carb Cleaner product for “on bike” dirty carb rehab efforts…it’s effective and harder to misuse. Put the Yamaha product in the fuel bowls only…not in the fuel tank! More here. What about Sea Foam? Is it safe? I regard the use of this product as mostly wishful thinking. Used as such, it is likely safe for internal carb parts. Indirectly, however, it can cause some problems as I explain below. My name is Matt Hanson and I work for the Sea Foam Company. I have just finished reading through the “More on Fuel and Fuel Additives” section on your website and I was impressed by your understanding of the problems we face with fuel and fuel additives today. Even your comments about over treating a fuel system with cleaning chemicals is right on the money because nearly all of them (other than Sea Foam) contain some kind of caustic chemical from methanol to MEK and xylenes and many other rubber and plastic eating compounds. Sea Foam is actually one of the only additives on the market that does not have this problem. 100% of the contents of a Sea Foam can are pure petroleum. They are extremely high quality oils that are far less corrosive than gasoline and have absolutely no effect on rubbers, plastics, silicones or any other delicate material. You can test this by pouring some Sea Foam into a styrofoam cup. It will not damage the Styrofoam no matter how long it sits in the cup. You can go a step further and place some rubber parts into the cup to soak in the Sea Foam – the more delicate the better. Sea Foam will cause no damage and will not even swell the material. Sea Foam was originally developed for use in outboard motors in the 1930’s and was safe for every cork gasket and rubber diaphragm that chemical additives would have destroyed. The formula has not changed since the 1930’s and Sea Foam remains the safest additive on the market. My view on Sea Foam – there are better fuel system cleaners, better fuel stabilizing products and better fuel lubricity products available. I’m still reluctant to recommend putting most fuel cleaning agents into old fuel tanks. That can loosen crud and add to your misery. I don’t ever use Sea Foam myself for that reason. If you have any fuel tank issues, the use of Sea Foam should be avoided in my view. If you live in Western Canada, you can safely fuel up at Shell stations, (all grades) or highest octane at Co-op stations. Neither of these have any ethanol. It’s marked on the pump at Co-op and I called the head office at Shell Canada to find out from them directly if they used alcohol. Vintage cars also have problems with the “new” fuels, and for all the reasons you’ve listed above. I just pulled the carbs off my vintage 1972 Suzuki Titan after letting her sit for a few months. Been riding various bikes for over 40 years and before ethanol blends were introduced I’ve let some sit for the entire winter season without a single problem, but until today I’ve NEVER seen such a mess in any carb anywhere before! Chock full of stubborn green scaling and whitish corrosion, and you could actually see where the metal was beginning to be eaten away. Of course this totally modifies all your jetting and can easily block small passages critical to proper carburetor function. As it turns out the gas station I was filling up at all summer had started adding ethanol, whereas before May 2016 it had none! Of course the gas station didn’t warn anyone of the change and if you want to know you have to ask. Ethanol attracts water and corrodes the hell out of anything brass or aluminum. If I’d left it sit in the carbs I’d probably be buying new ones right now for a total cost of about $500 bucks. And all due to ethanol in the gas. Don’t let any weekend warrior or consumer know-it-all tell you any different. Unless you’re a mechanic you’ll never see what this crap actually does to the inside of your machine, you’ll just timidly hand over the major bucks that it will cost you to fix it. “Fear the corn” only confirmed what I just learned… the hard way! Imho these gas companies and brainless “environmentalists” should all be hung from the nearest tree! First, you get less power and mileage from ethanol blends but you’re still paying the higher price of gas. It’s highway robbery. Kinda like a sleazy bartender watering down your drink and telling you it’ll get you more drunk. Total BS! Second, the production of the ethanol itself causes more pollution than it prevents. But worst of all it’ll sack your engine in record time if you’re not careful and mistakenly run it in almost any engine that’s not specifically designed for it and it will kill small engines like lawnmowers, chainsaws, and snowblowers even faster! Never put this adulterated crap in your vintage motorcycle or small engines, and if you have to then don’t let it sit for more than a few weeks or you’ll likely pay dearly for it. If ethanol-free gas is available use it! In my opinion if anything ever merited a class-action lawsuit this is it! Great article, well said for sure. I’m in the power equipment repair business and see many ethanol issues. Some addition recommendations worthy of note. Be sure all gas cans are sealed, close the vents. Any exposure to the atmosphere draws moisture in. Many older machines use vented fuel caps, during storage try a balloon or condom over the cap. It will prevent moisture yet allow thermal expansion. And lastly never empty the last bit of fuel from a gas can into a machine, any water and dirt remains at the bottom and will flow into your machine. What’s your thought on the 100 octane race gas that is available at some gas stations? Here in Charlotte I run the 100 octane in my Harley as the temp rising to decrease the risk of detonation, but I also wonder if this is pure gasoline with no ethanol at all. Granted it’s $7/gallon, but I enjoy the smells it makes in the bike and I have never had any issues riding an air cooled Harley even in 100+ degree heat using this gas. Great article overall and I’m steadily reading more and more on this site as I venture into my first GL1000. I often run aviation fuel for the reasons stated above – it never contains ethanol! I have been told that running aviation fuel will be a good ,but expensive alternative for those of us that don’t ride as much as we should. Yes. Aviation fuel is expensive and a “hassle” to buy since all of it is behind security fences. But, I like it for vintage motorcycles since it eliminates all problems associated with ethanol. The FAA is wise enough to prohibit ethanol for general aviation use! Any thoughts about “STARTRON” as an additive? I use it on the recommendation of my BMW mechanics to keep the injectors clear from the build up caused as you explained by ethanol gas. Sorry, I’ve never evaluated that product. I suspect it is a decent fuel stabilizer. I prefer Marine Grade Stabil for the extra lubrication which protects the fuel tank from corrosion. Ethanol has 1/3rd less energy content than regular gasoline, so you will get 1/3rd less power (&MPG). If E85 cost 1/3rd less than gasoline, I would urge modernization of an old bike’s carburetors. However, E85 costs about 3/4s of the cost of Regular(E10) gasoline, so I burn non-alcoholic regular gas in my GL1000 and GL1200. Yes, non-alcoholic regular gas costs about $0.50 per gallon more than E10 regular, but that’s my choice. Observation of my wifes Prius has taught that ethanol burns exactly as well as water. Ten percent ethanol equals ten percent mileage reduction. If the facts were well known we could stop the madness. I appreciate and agree with your remarks about ethanol fuels. One small issue which I question is your statement that we should use regular fuel instead of high octane because regular is less volatile. I have always understood that the purpose of the chemicals which raise the octane rating is to slow down the rate of burn so as to reduce pre-ignition. The flame propagation or volatility of regular gasoline is faster. One small point which you might want to investigate further. I agree that the use of the word “volatile” in that context was confusing, so I re-worded that section a bit. Thanks. Dear Sir, does this mean that the higher octane fuels are also less powerful? Many of the people that I have known and ridden with have “assured” me that high test gas gave the motor MORE power. What a waste of money! Eric: Yes. Your friends are misinformed on this issue. Unless you have a high-compression engine that requires higher octane fuel, premium grade fuels are a waste of money with no performance benefit. In fact, the only benefit of higher octane fuel is to prevent “knocking” or “pinging” which can lead to serious damage hen you run lower octane fuel in a high compression engine. There are all sorts of horror stories about ethanol causing problems in carbs, but all I can say is that it hasn’t been my experience. My GoldWing’s engine & carbs came from a ’79, that flipped upside down when it crashed. When I bought it in ’92 I disassembled the carbs and cleaned the motor oil out of them (it ran through the breather to the air cleaner when the bike flipped and then down into the carbs when the bike was righted, displacing the fuel and preserving them nicely. Since then it has been run almost exclusively on E10 fuel. I don’t remember even seeing a pump that didn’t have the little “May contain up to 10% ethanol” sign since at least the late ’90s. When the carbs stated acting up in 2008 I bought Randakk’s kit and rebuilt them. They hadn’t been opened up in at least 15 years and still had the original rubber parts that I re-used in ’92. Every o-ring had hardened and I had breaking them with pliers to get them out but the metal parts were really, really clean. I doubt that the failure of 29 year old rubber parts that have been sitting in gasoline for extended periods had much to do with ethanol. I’m sure it would have taken a lot less than 10 years of running E10 fuel for ethanol related problems to surface. Before anyone gets the idea that I support the addition of ethanol to motor fuel, I will state that I do not. 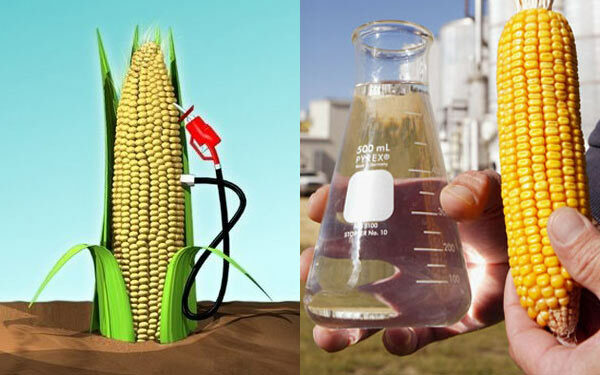 It isn’t that I believe that ethanol causes any harm, but simply that the energy inputs required to make ethanol are greater than the energy produced by burning it so it just isn’t worth the trouble. My F150 is a flex fuel truck, but the manual says to DOUBLE the maintenance frequency when using E85! No thanks, and then there’s the reduction in energy density. I’ve never seen a price for E85 that seems to correlate with the lower mileage much less the increased maintenance costs. A lot of us who own vintage carburated motorcycles also own modern fuel injected bikes. I haven’t read a lot about the use of E10 and it’s affects on fuel injected engines. Are there similar issues to consider or is E10 alright. I suppose the water layering issues in the tank would still exist but does the E10 have any effect on the other fuel system components? Most of the same issues apply for any infrequently used vehicles including those with fuel injection …especially corrosion issues. The good news is the fuel injected vehicles are a bit more tolerant due to the high fuel pressures and the lack of tiny idle jet orifices as found on carbs. The service stations in our small town only provide ethanol, or premium that is ethanol-free. What are your thoughts on this circumstance? Ethanol-free premium is fine in most cases. I hear all the arguments about reducing CO2 by using bio-fuels etc, and I think that this is great. At least people are starting to think about global climate change issues, but there is also a big picture that we should consider. Let’s say that everyone switches to bio-fuels like Brazil are trying to do. How are we going to supply millions of vehicles all requiring to be fuelled every day, 24/7, year after year? We need to increase production dramatically, start using sugar cane, corn and whatever will ferment to produce alcohol. We will have to replace many crops for food to make fuel. I suspect that most of the food production will cease because bio-fuel is probably a better cash crop. I suspect that this would be a huge change in the way we live and feed people around the globe. As much as I like the idea of renewable fuels, i think that we need to address the ever increasing thirst and hunger this globe has for cars and subsequently fuel. In short we need to look at the bigger picture and try to predict what consequences our (today’s) actions will have on the world in the future. Prior to your Web site reconstruction, you recommended the use of Chevron Techron once a year. Now, I no longer see it discussed and you’re now recommending the use of STA-BIL Marine. Can I assume that you no longer recommend the use of Techron? Correct. I’m mostly “neutral” on the issue of Techron and similar products. It’s a good product, but my concerns lie in the area of dislodging contaminants from ancient fuel tanks. Very fortunate to live in Northern Ontario Canada. We have no ethanol in any of our grades of fuel however most folks don’t like coming here due to the price of ethanol free fuel. The benefits out weight the costs but I understand the environmental issues. Small population over here and the cold weather does create lots of issues with ethanol based fuels. I would however like to put a plug in for Lucas Octane Boost. Been using it with peppy results and quiets engine of my old wing significantly. Any thoughts or experience with Sta-Bil’s new 360 product? Is it a better alternative to Sta-Bil Marine? I have not done extensive testing yet but expect that this product will be recommended. Thanks Randal. I just completed a complete carb rebuild on my 75 and having followed your guidelines and best practices it is running like a dream. Thank you for your experience and insights I want to make certain it stays that way and the 360 product has promising claims. I will give it a test run this winter and report back in the spring. John: Thanks for the good feedback!